Tag Archive | "Japanese Trapdoor Snail (Bellamya chinensis)"
The Japanese Trapdoor Snail (Bellamya chinensis) is known to tropical fish keeping enthusiasts as the Chinese Mystery Snail, Black Snail, Trapdoor Snail, Japanese Mystery Snail, Black Japanese Trapdoor Snail, Asian Apple Snail, Rice Snail and Oriental Mystery Snail is actually classified as a “pond” snail that can survive in Northern climates and considered a problematic invasive species in several areas of the world. Japanese Trapdoor Snails are native to East Asia, from the tropics of Indochina to northern China. It’s native range is from Southeast Asia to Japan and eastern Russia, but is widely distributed in China and the United States. In the late 1800s, they were sold for food in San Francisco’s Chinese markets and they are now well established in California and several Northeastern states. The Chinese Mystery Snail scientific name (Bellamya chinensis) is synonymous with Cipangopaludina chinensis, Cipangopaludina chinensis malleatus, Cipangopaludina chinensis malleata, Viviparus malleatus, Viviparus chinensis malleatus, Bellamya chinensis and Bellamya chinensis malleatus. The Japanese Trapdoor Snail is a large freshwater snail that has an operculum and gills. When the body of the snail is fully retracted, the operculum (or trap door) seals the shell up to protect the snail against predators and from drying out. They have a thin smooth conical globose shell with clear growth lines which is can be an olive green, greenish brown, brown, or reddish brown color. The shell has 6 or 7 whorls and the inner color can be white to pale blue. Although Bellamya chinensis is usually a brown gray color, their colors and patterns can vary considerably. Japanese Trapdoor Snails prefer bodies of water that have soft, muddy or silty substrates. They can be found in freshwater lakes, reservoirs, slow moving streams and rivers, ponds, and rice paddy fields. They prefer slow moving to stagnant water and can survive a variety of water chemistries. For optimum growth they need a temperature of 68 to 82° F, a pH of 6.5–8.4, and calcium concentrations of 5–97 ppm. Bellamya chinensis will hibernate when water temperatures drop lower than 50° or higher than 86 °F. and are one of the few species that can survive in Northern climates. 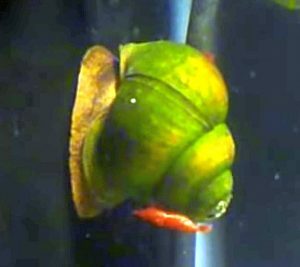 Chinese Mystery Snails are voracious algae eaters and are used to control outdoor ponds, water gardens, and large aquariums with excessive algae growth. They do minimal damage to plants and will also consume uneaten fish food, vegetable matter, diatoms, and decaying organic and inorganic debris from the bottom. They are a peaceful species that make a great addition to ponds and in particular aquariums. They will not eat fish eggs or plants, they will not overrun a tank, and they close up their operculum when the water quality diminishes; acting like a canary in a coal mine. Japanese Trapdoor Snails are a live bearing species. The embryos develop inside the eggs which remain in the mother’s body until they are ready to hatch. All females will generally contain embryos from May to August. The young are born in shallow water from June through October in eastern North America. After the young are born, the females migrate into deeper water during the fall for the upcoming winter. Females can bear over 100 offspring in any given brood and well over 200 in their lifetimes. Females can live up to 5 years, while males live only 3 to 4 years. 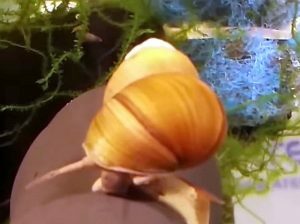 In an aquarium environment, Japanese Trapdoor Snails will usually quickly consume all the algae in the tank and will need supplements of live, frozen or freeze dried fish foods, vegetables, algae wafers , carnivore pellets or bottom feeder tablets. Bellamya chinensis is available for purchase online at a size of 1/4″ to 1 1/2″ except in states where they are considered an invasive species.